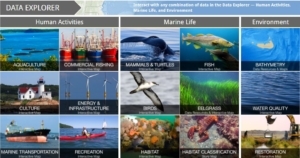 The Northeast Ocean Data Portal is a decision support and information system for managers, planners, scientists and project proponents involved in marine planning. The Portal provides access to data, interactive maps, tools, and other information needed for decision making. Some of the data in the Portal are drawn from marine cadastre, and the Portal integrates these data with regional data sets into a format that is useful for regional-scale planning. As a member of the Data Portal Working Group, TNC develops and contributes ecological datasets which contribute to regional ocean planning efforts.